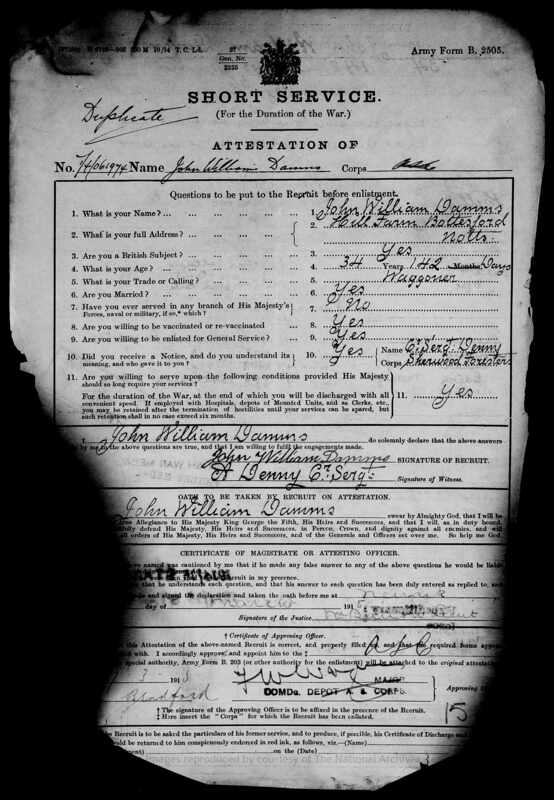 John William Damms' military service record, 1919. 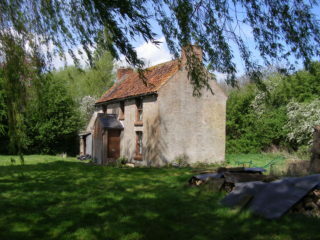 The lock-keeper's cottage at Stenwith in 2007, after Sid Damms had left and the cottage was empty. John Wm Dammes is one of the men named on the Bottesford ‘church list’ of WW1 Servicemen. John William Damms’ family background is a little difficult to trace. He spelt his family name as Damms and Dammes (with an ‘e’) at different times. However, he was probably the John William Damms born in 1880 in the Boston district. Confusion arises because there were at least three John William Damms or Damm born in the period 1874-1880 in Lincolnshire. The General Register of births confirms that a John William Damms was born in 1880 near Boston, but also that there had been another John William Damms, born 1874 again near Boston, and a third one, named John William Damm (no ‘s’ on the end) born in 1879 at Caistor. 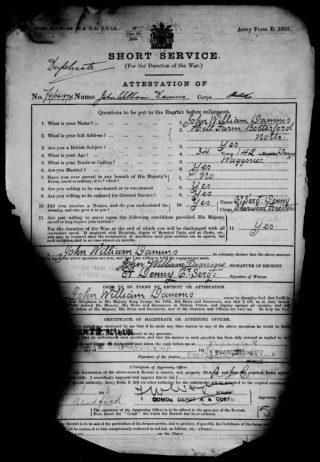 Military records have been examined which confirm that two John William Damms were born at Sibsey, near Boston, at about 1879-80. It is concluded that information in the 1911 census which seems to indicate that John William Damms was born in 1876 rather than 1880 may be a simple error. John Damms died in 1904 in the Boston area. His son, John William Damms, married Ada Francis on February 5th , 1905, in the Grantham area. Their address at this time was Retford Cottages, Queen Street, Bottesford. However, they soon moved to Wanlip, in the Soar Valley between Loughborough and Leicester, where they started their family. The 1911 Census records the Damms at Jericho Lodge, Barkestone-in-the-Vale, near Bottesford. Here were waggoner J. W. Damms, his wife A. Damms (Ada), son Willie (aged 5, born at Wanlip), daughter Gladys (aged 2, born at Wanlip) and another daughter Hilda (aged 1, born at Wanlip). J. W. Damms gave age as 37, implying that he was born in 1876. However, the information on the census form was written clumsily, and incompletely. The location of J.W.’s birth was added later in pencil, presumably by the enumerator, as ‘Rutland’ even though he in fact came from Sibsey near Boston. Nevertheless, it is clear that this J.W. Damms was the man who was in fact born in 1880, and who in 1915 would become a Driver in the Army Service Corps. By the time he enlisted, there were two more children, Edith Mary (b. Bottesford, 1913) and Sidney (b.Bottesford, 1915). Two further sons were born after the war, Ted (b.Stenwith, 1919) and Ron (b. Stenwith, 1925). 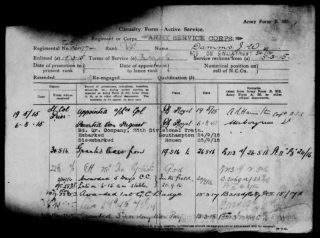 There are WW1 service records for two men called John William Damms, both from the Boston area of Lincolnshire, and it is important to try to avoid confusing them. Both were about 35 when they enlisted in 1915, and both were agricultural workers. They may well have been cousins, sharing the same name and both born in Sibsey. The John William Damms that this page refers to was Driver T4/061974, 198 Company ASE, Army Service Corps. The prefix ‘T4’ indicates that he was attached to a Horse Transport unit. The meaning of ‘ASE’ is uncertain. He first enlisted on the 17th September 1914 and was passed as a driver, but was sent home on furlough. He attested again on the 7th March 1915 at Blandford, describing himself as a waggoner, living at Hill Farm, Bottesford. They must have moved to this address after the 1911 census was taken. The record also states that his wife, Ada Francis, was living at Retford’s Cottages (while her husband was away in the army), and that at that time their children were Thomas William, Gladys Mary, Hilda May and Edith Mary. There is no doubt that this is the man remembered on the Bottesford ‘church list’. Driver Damms was promoted to Lance-Corporal on the 9th May 1915, but at his own request reverted to the rank of Driver before he arrived in France on the 24th September 1915 to join the BEF. On the 25th May 1916 he joined the 25th Division Cyclists. He received the 1st Good Conduct badge on the 15th March 1917, and went on to be awarded the 14-15 Star, Victory Medal and British War Medal. There is no evidence that he suffered serious injuries or sickness during the war, though his initial medical record states that his right clavicle had been broken 14 years before. He was finally demobilised in January, 1919, his pay address High Street, Bottesford. The other soldier called John William Damms was Private 534192, originally with the Lincolnshires but transferred to the Labour Corps soon after enlisting. He joined up at Boston on the 29th April, 1915, giving his profession as a shepherd, his address at Harts Ground, Dogdyke, near Lincoln. He was part of 683 Agricultural Company. He suffered shrapnel wounding on the 30th November, 1916, and repeatedly underwent treatment for his wounds. He also developed acute rheumatism, and in 1919 suffered from influenza and bronchitis before being discharged from the army, perhaps lucky to have survived. In the 1901 census, he lived at Turnpike, Bicker, near Boston, with his wife Sarah A Damms (neé Coulson). In 1911, they were at Chapel Hill, Dogdyke, near Tattershall, with their sons Albert Percy and John William. As already stated, John and Ada’s last two childen were sons Ted and Ron, born at Stenwith in the years after the end of the war. The 1939 Register records farm labourer John W Damms and Ada Damms, together with their youngest son Henry (Ronald H) Damms, also a farm labourer, born in 1925, at Greenwoods Barn, Denton, Lincolnshire (a village near Stenwith). The ‘other’ John William Damms was in 1939 living in the Coastguard Cottage, Sea Lane, near Boston, with his daughter Eva. John W Damms from Stenwith died in the Grantham area in December, 1959, aged about 79. Ada, born in 1883, died in 1967 and was buried in Grantham Cemetery on the 10th of February, aged 80. Their sons continued to live in the Vale of Belvoir, sometimes in Bottesford or in the canal lock-keeper’s cottage at Stenwith, near Woolsthorpe-by-Belvoir. The Willie – Thomas William – referred to here is my father (known in later years as Bill). He was born 28th Nov 1905, the address given on his birth certificate is shown as 1 Mission Place, Manners Street, Little Gonerby. Sidney was at the great naval base in Singapore when it was captured by the Japanese, and he was taken POW for over 3 years. He worked on the Burma railway. There were 2 more sisters not mentioned here, Margaret, who was killed in a motorcycle accident, and Elsie, making 9 children in all. Dear Brian, Thanks very much for providing this additional information. Neil Fortey (ed). PS Do you mind if I ask if you have old photos or other documents that we could add to the archive?